Ever since my first NES, I've been addicted to light gun games. I still dust off the Saturn and pull out the first or second Virtua Cop games, or the original House of the Dead, and I even have to admit I've spent more than my fair share of time playing Konami's Lethal Enforcers. If there's a light gun for a system, then you know I'll be there to get it along with all the games I can find for it. My sister was kind enough to get me a PS2 for Christmas. I had a momentary pang of regret at first, considering the meager stack of books I got her in exchange, but I felt a bit better as I recalled all of the cool stuff I've purchased for her over the years, like the Final Fantasy VI OSV. In any case, it was a great gift, since I probably would have held out for quite some time had she not done me the favor of getting the only game system I didn't have. A quick trip to Best Buy had me eagerly seeking out all the games I needed, and when I found Time Crisis 3 with the Guncon 2 included, I was sold. I was rather impatient as I waited for the manager at the register to check me out, but given the mess that is the Best Buy POS (Point Of Sale system, that is), I just imagined how much fun I would have playing the game when I got home. The gun connects to the PS2 via the USB ports on the system, which is nice, because that means you don't have to pull out controllers every time you switch games. If SONY wasn't so mean, they'd have slapped a couple of extra controller ports on their system - like two systems before it and two systems after it. Luckily, using the USB port circumvents this problem altogether. The only other connection to be made was a little pass through video cable to help "increase the accuracy of the gun," according to a pal at EB Games. It wasn't too alien to me, as the first generation Guncon had this same cable. My girlfriend has a modestly-sized TV, - only 19" - but it was good enough for all the other games I've played at her apartment. Unfortunately, it wasn't good enough for Time Crisis 3. So there you have the single worst thing about the game - the gun may not work correctly with all TVs. In fact, the instructions say it will not work at all on a projection TV, and it probably won't work on most HDTVs, either. We eventually got the sight to register on the screen, but to do so, we had to sit about one foot away from the screen, and on her coffee table. Oh, the things I must do to play the games I love! After correcting this space-related difficulty, the game was great. There are three primary ways to play the game - Arcade, Rescue, and Crisis mode. Rescue mode is available after clearing the story mode, and Crisis mode is opened up after you finish Rescue. If you can't finish a stage and lose all of your lives (the number of which vary, depending upon how many you want in the Options), you start off with a limited number of Continues. However, every time that you play the game and exhaust all of your Continues, you're given an additional maximum credit for the next time you play. Eventually, after dying enough times, you'll earn Free Play mode, which allows you, well, free play. This is, in fact, a very nice feature, for skilled players can just play through the game while the less talented ones (like me, apparently) can eventually plot their way through. Rescue mode and Crisis mode are both less forgiving, however, requiring certain objectives to be met before clearing a stage. In those, even with free play, if you lose the one life you're allocated per stage, then you must start over. However, this adds challenge to the game, and playing it enough to unlock those modes usually means the player is up to the task of completing them, as well. 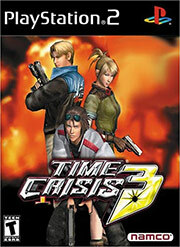 The original Time Crisis had one unique addition to the sacred formula of shooters, something that is as brilliant as it is simple, and this sequel carries on the tradition. In Time Crisis, we gained the ability to duck. Instead of standing up like a block of wood, waiting for terrorists to poke holes in you, you can actually take cover until you're ready to do some hole-poking yourself. Thus, a new level of complexity was added to an old genre, and Namco helped build its reputation as an amazing innovator. Sure, it wasn't the first 3D light gun game, but it made the genre better. To account for this extra advantage, a measured amount of time is granted for each section of the game, and that's where the title comes into play. I've spent the last two years playing X-Box and GameCube games, and before that, I spent most of my spare time on the Dreamcast. While this game features impressive character models, detailed locales, and very nice animation, I can't help but feel that everything looks uglier on the PS2. I had heard about the aliasing problems that cause these jaggies, and it appears that even this late in the system's lifespan, they still haven't been smoothed out. Essentially, the PS2 is a modemless Dreamcast, minus two controller ports, plus a buggy DVD player. Oh, and it costs more. I can't take that out on this game, however. Like many other light gun games, there is also a two-player mode. Unfortunately, it splits the screen into two, and because of the locked aspect ratio, the two resulting squares are far too small to be playable on any but the largest TVs. Seeing as this doesn't work on 90% of the big screen TVs out there, that's a bit of a disappointment. Ah, but fret not, there remains a solution! With a handy link cable, you can hook up two PS2s, with two copies ofTime Crisis 3, and play the game on two separate monitors. I was so excited to hear that, it almost made up for the jaggies. Unfortunately for me, my PS2 doesn't have a link port. Apparently, SONY heard that I was getting a PS2, and out of spite, they removed the link port from newer models of the system. That's right, I got a PS2+ system, which isn't supposed to mysteriously die as much, has a quieter fan, and a DVD player that isn't so finicky. But there's no link port. Ironically enough, I would've purchased another PS2 just to try out the link feature for this game. I'm not much for online gaming, but my whole house is networked for LAN parties, and this game is amazing in the two player mode...at least, it should be. The music is enjoyable enough, with tension enhancing tunes keeping your heart racing while madmen shoot at you. It's not a soundtrack I'd buy, but it works in the game. The voice acting is surprisingly sound, though as always, I wish I could hear the game in Japanese. That way, if the voice acting is bad or annoying (like, say, every domestic Square game released with voice acting to date), I won't be able to tell. Some games have bad enough voice acting that I'd rather have crickets dub the lines than whatever corpses the producers found to fill the roles. This game isn't one of those. The script is cheesy, but the acting's okay.